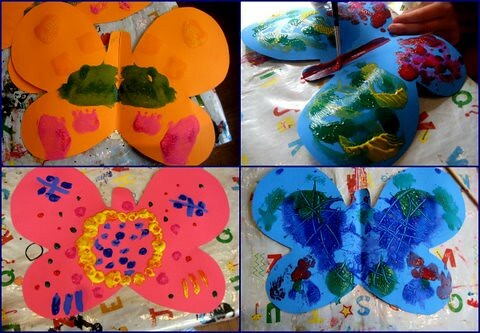 Following on from yesterday’s The Very Hungry Caterpillar craft ideas for caterpillars, today we have a selection of butterfly crafts. The designs are all very simple again, making them easy for very young children to try. Working with the idea of butterflies gives the opportunity to talk about symmetry and with older children you might want to encourage them to focus on creating matching patterns, as part of a more mathematical activity. With young children though I think the main purpose behind these crafts is to invite them to enjoy the colours and see what patterns they can make – so I would never give strict directions about making sure both sides match. 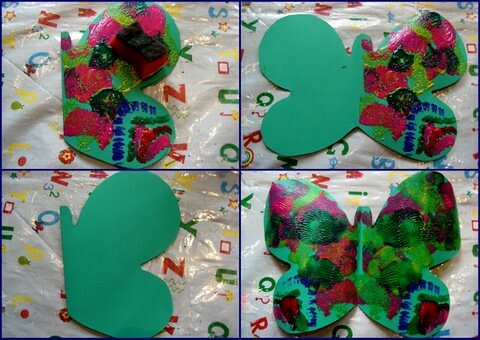 This idea is a childhood classic – painting on one side of a piece of paper, folding and squishing the paint, and then opening it up to reveal your butterfly. I particularly love this technique because it’s open to all children – even babies. 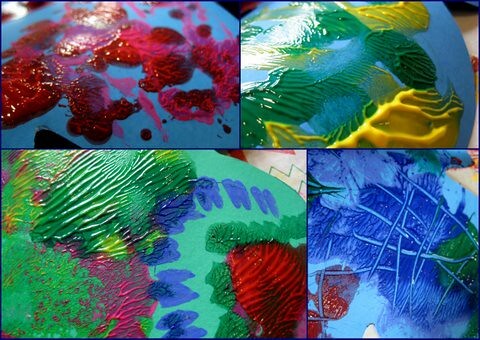 Everyone can join in: finger painting, smearing colour around, making hand prints, using brushes or sponges to apply the paint. And my kids really love the surprise reveal when the final pattern is peeled open and revealed. 1. It might be hard for the children to understand the idea of painting at first on one side of the paper only, and you won’t want to pester them all through the activity to stop painting on the other side. If you fold the paper over so the side to be kept clear is underneath and only the side that needs painting is presented to them (see above), then they can go for it, applying the paint wherever they like, without any restrictions. When they’ve finished you can fold it the other way to make your print. 2. I’d do a demonstration of the folding and squishing first before using their own art work – some children can be very upset if they think you’re spoiling their design, so best for them to be happy with the plan before you try it. 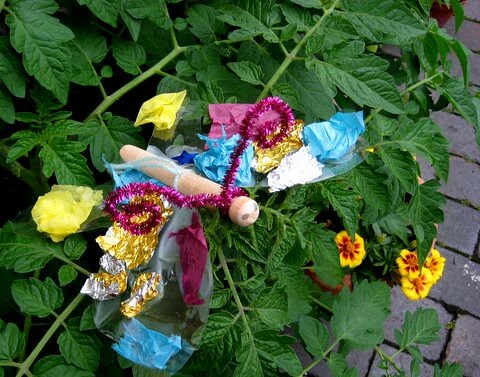 These twirling butterflies were inspired by an idea Amanda created for Make and Takes. Amanda’s children made ladybirds, but I think they’re also beautiful with a butterfly design, and the kids can paint, pattern or collage any design they choose. Make and Takes has a step-by-step guide to assembling them. A tip I’d add: if you laminate the pieces of card before assembling them they’ll withstand a little rain so you can have them twirling in the garden. We used a wooden clothes peg to make a butterfly mobile: here’s our step-by-step guide showing how we made it. We’re continuing our celebration of Eric Carle’s birthday tomorrow, with a post packed with ideas for having fun with The Very Hungry Caterpillar activities. We love making butterflies like that – but love how you brought two these together to make a lovely 3d mobile. Perfect! I also love the mobile.. both are cute- the butterflies and ladybirds. These are really cute, so glad the ladybugs inspired you, this must have been so fun! I LOVE the craft peg version! What a great idea! What fun! 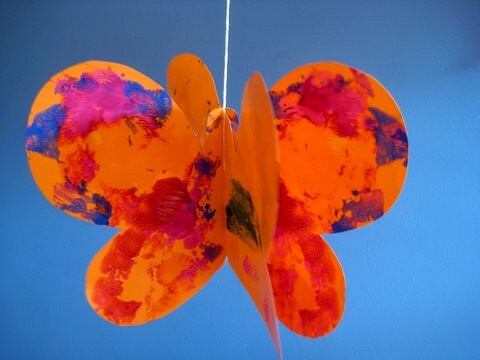 I am excited to make a butterfly mobile. Can you imagine how beautiful to have a few flying above my daughters bed? Sweet Pea loves butterflies and I think she would have so much fun with the painting and folding over version. Great idea. I love this idea. We got a book on ink blots and have been wanting to do it. I think this would be more fun. Thanks for sharing at art4littlehands.com. I love your child centered art ideas!